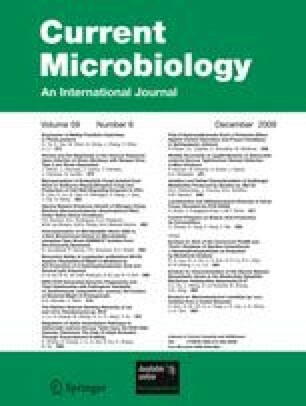 A Gram-negative, rod-shaped, non-spore forming, non-motile and moderate halophilic bacteria designated as strain CMC-5 was isolated from decomposing seaweeds by enrichment culture. The growth of strain CMC-5 was assessed in synthetic seawater-based medium containing polysaccharide. The bacterium degraded and utilized agar, alginate, carrageenan, xylan, carboxymethyl cellulose and chitin. The strain was characterized using a polyphasic approach for taxonomic identification. Cellular fatty acid analysis showed the presence of iso-C15:0 as major fatty acid and significant amounts of iso-C17:1ω9c and C18:1ω7c . Phylogenetic analysis based on 16S rDNA sequence indicated that strain CMC-5 is phylogenetically related to Microbulbifer genus and 99% similar to type strain Microbulbifer elongatus DSM6810T. However in contrast to Microbulbifer elongatus DSM6810T, strain CMC-5 is non-motile, utilizes glucose, galactose, inositol and xylan, does not utilize fructose and succinate nor does it produce H2S. Further growth of bacterial strain CMC-5 was observed when inoculated in seawater-based medium containing sterile pieces of Gracilaria corticata thalli. The bacterial growth was associated with release of reducing sugar in the broth suggesting its role in carbon recycling of polysaccharides from seaweeds in marine ecosystem. The authors would like to thank Dr. Tapan Chakraborthy, Institute of Microbial Technology, Chandigarh, India, and Dr. Shanta Nair, National Institute of Oceanography, Goa, India, for DNA G + C and FAME analysis, respectively. This work was supported by Department of Science and Technology, Govt. of India, New Delhi (SERC Fast Track Scheme No SR/FTP/LS-264/2000).